After Confronting NYC Mayor, Police Union Leader Faces Mutiny of His Own from Dissident Cops | Democracy Now! award-winning columnist with the New York Daily News and Democracy Now! co-host. After leading a controversial campaign against Mayor Bill de Blasio, the head of New York City’s largest police union, Patrick Lynch, is facing an internal challenge of his own. Lynch, who accused de Blasio of having “blood on his hands” for a gunman’s murder of two officers and later spearheaded the two-week arrest and summons slowdown by New York City Police Department officers, will be challenged by dissident cops in the Patrolmen’s Benevolent Association’s next election in June. Democracy Now! co-host and New York Daily News columnist Juan González discusses the revolt, which he attributes in part to a changing NYPD demographic that in recent years has seen officers of color become the majority on the force. AMY GOODMAN: Juan, before we go to our first segment, you did a very interesting column in the New York Daily News on the Patrolmen’s Benevolent Association, the union of police officers in New York, and its leader, Pat Lynch. But now it turns out there is a huge dissension within the ranks of the police department itself. There was a—Pat Lynch had issued a letter asking cops to disinvite the mayor and the City Council speaker, Melissa Mark-Viverito, from any funeral in case they were killed in the line of duty. Only 4 percent of the cops have signed on to the letter. Yesterday there was a meeting of the union of the police delegates, and there was an open fight that broke out between several of the pro-Lynch people and the anti-Lynch people saying, “We don’t care about an apology from the mayor. What we want is for you to handle our grievances and our problems that we have as police officers,” because the police have been without a labor contract for five years. And now I’m reporting in today’s Daily News that there is an entire slate of people that is preparing to run against Lynch in union elections that are being held in June. And he hasn’t had a challenge since 2003. He’s been the president of the union for 15 years. So, there’s a major convulsion going on within the police union. And, of course, it’s against the backdrop that the New York City Police Department now has a majority of minority officers, African-American, Latino and Asian officers. It’s not the same police department that existed 15 years ago when Lynch was first elected. And many of those officers are equally angry over the past practices of racial profiling, of stop-and-frisk arrests, and they, too, are demanding some kind of change. So, we’re going to have to see what happens, but clearly there’s not the kind of unity among the police against the mayor that has been portrayed so far in the press. AMY GOODMAN: We’ll link to your column at democracynow.org. I also encourage people to go to our website to look at our interviews with the New York police officer Adhyl Polanco, as well as retired detective Graham Weatherspoon, all talking about who actually represents the police in New York. 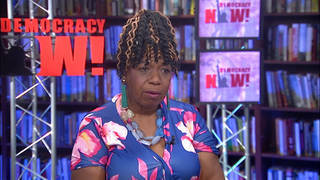 This is Democracy Now!, democracynow.org.